Super Important Message!!! Since Google is going to discontinue Google Friends Connect in March, I have added the NETWORKED BLOGS Button to my sidebar. I would so love to still have all of you as followers, so I hope you will click on the Networked Blog button to follow. Thanks so much. I will look for the networked blog button on your sidebar also so I can continue to follow you. Sometimes we just need a little quiet time and a nice hot bubble bath. I seem to be one of those that can't turn the brain off, so while I was soaking all I could think about was changing the vignette on the bathroom vanity counter. So, after a nice soak, I started looking for things to dress up the bathroom a little. 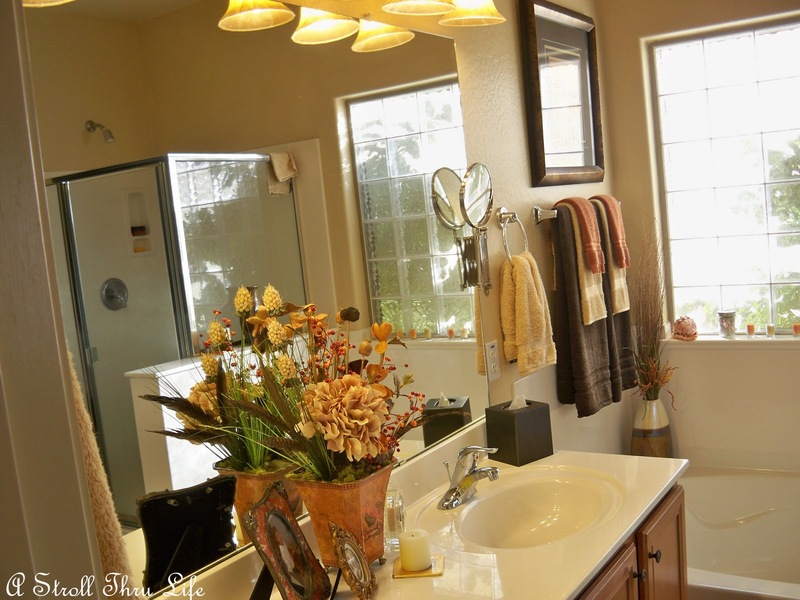 Bathrooms are so hard to photograph, and mine really isn't very big. This is the view you see as you enter. A smallish vanity with double sinks, so the only area I can decorate is the center section. Yes, I know, I am moving those pictures all over the house. These were in the livingroom previously, but since I put new ones there, these came in here. A little frenchy rooster cache pot floral arrangement, candle and clock. Nice and simple. The colors and the arrangement go well with the rest of the decor. As you can see, I am still on the kick of adding feathers and pods to floral arrangements. I love the combination. Just a really small change, but something fun for me to look at for a change as I get dressed and do my makeup. Please be sure to click the Networked Blog button to follow, or subscribe in a reader to continue to follow. Take Six left me a message saying that she believes it is not going to affect bloggers. She interprets their message to say all non bloggers. It does in fact say all non bloggers, so hopefull we can all still follow each other with our usual Friends Connect. Let me know what you all think. I am totally confused. This is the link, so read it and let me know what you think. Ok I did it....why do they have to change things again? I must be getting OLD! mighty pretty arrangment on your bath counter. I'll add that button and join yours. Marty, I don't think it will affect blogs. It says they "are retiring the service for all non-blogger sites". I may be reading it wrong or maybe it's wishful thinking on my part. Anyway, I added the link above that I read. Let me know what you think? I don't know anything about this change. So, we will have to start over getting followers again? Help?? More information please! I do some of my best thinking in the shower or occasional tub bath. It is quiet, I'm alone and I get all sorts of creative ideas. Your bathroom looks so elegant. I can't believe they are doing this to us! So upset. Oh boy, I better add that option too Marty...YIKES, I sure hope we do not lose our readers in the process. Pretty arrangement. Oh my! Where do we go to get the new set up? I need to take time to spiffy up my blog a bit, but did not know I would I would have to add something else. Help! Sure hope Tanya is right. I really hope it doesn't affect bloggers, but just to be safe, I added the button as well. I was actually already on networkblogs, but have never added the info to my site. I hate the thought of it affecting us....it would be like starting over! I hope they don't remove the friends google follower because I'm sure alot of people will not be able to get all of their original followers back! Some people have thousands that have accumulated over several years too. 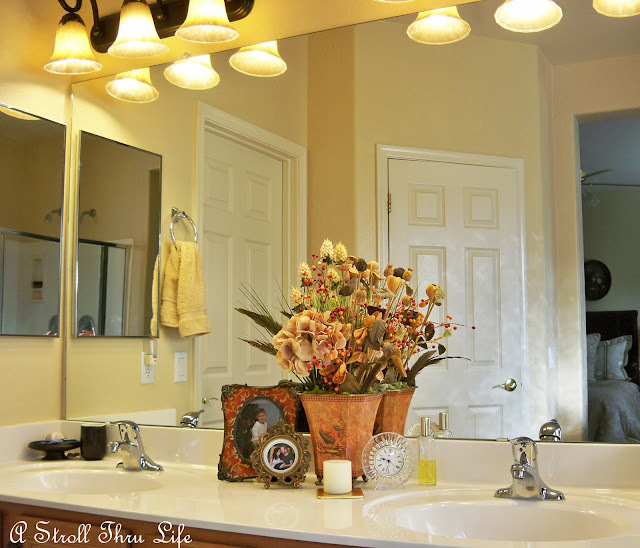 I really like your decor arrangment in your bathroom. It reminds me of the set-up my MIL has. I like the google friends connect...hope they don't take it away. I have been on networked blogs for awhile. I'll click to follow you if I haven't already. I just read what Kelly said. I don't think we would ever get all our followers back. I had about 1500 when the big glitch at Blogger happened in Sept 2010 and I have only had a little less than 600 catch up with me over at typepad. Just the right amount of decor, Marty! 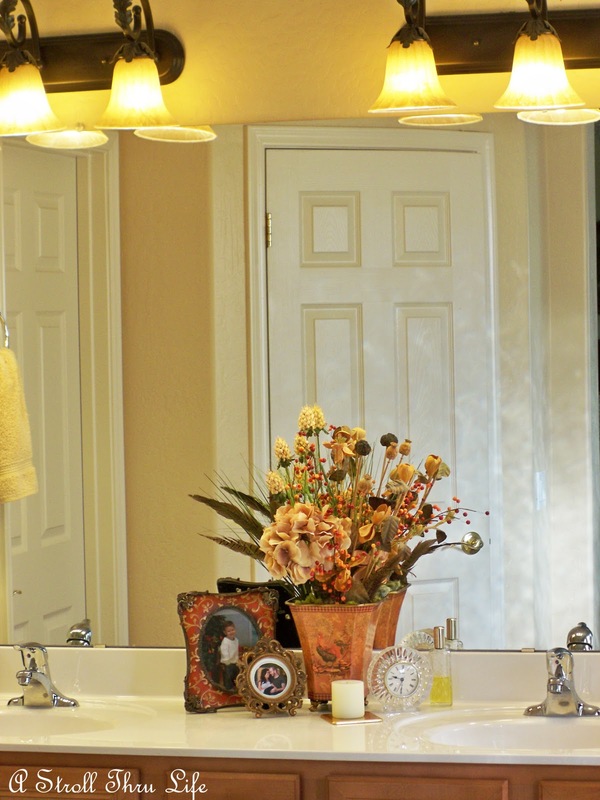 We have a vanity area in the middle of the two sinks in our bathroom and I've used that to display the pretty stuff. I was looking all over for an outlet, because I thought a little lamp would have looked nice, but there isn't one. So, candles it is! That's the first I'm hearing of this, Marty! I'm going to have to read more about this. Marty, what a pretty bathroom vignette. I do my best my thinking in there! I have clicked on your button and added the button to my site. Hopefully, we'll all keep up with each other! Investigating the blogger friends thingy! Thanks for telling me!! I'm sure at some point they'll phase it out for everyone! Thanks for the heads up. I am confused, too. 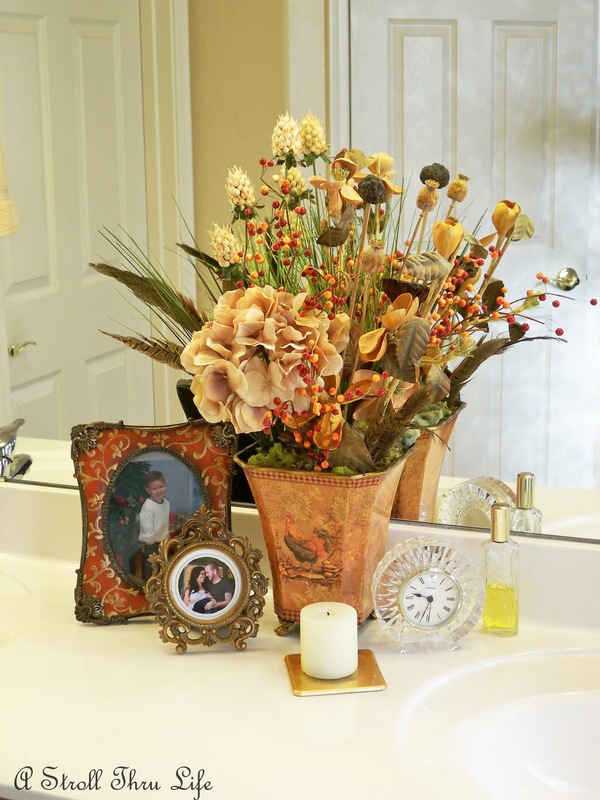 Love the warm colors in your bath and the arrangement is gorgeous. Don't forget to link! Marty your changes look wonderful ! I'm going to go read all the links you provided. Oh my, Marty! I may be reading it wrong too, but was thinking it would not affect us...oh my, if so, hate the change. Not fair. Now I'm whining. I just put the networked blogs box on my blog last night. I'm on Wordpress, so I'm expecting GFC to disappear. 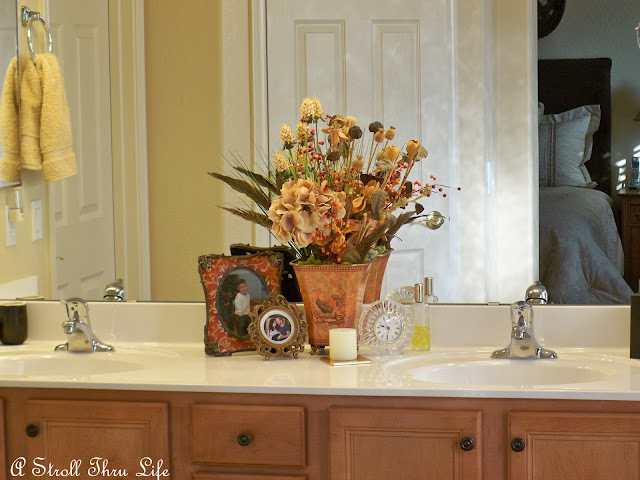 All this blogging business is making me want to take a long soak in the tub! Marty does this mean I have to sign up and get a facebook acct. Because I tried to follow you and it told be to sign in with facebook and I don't have a facebook page?? If we don't have one are we going to lose all our followers? As far as Google Friend Connect, it will affect non-Blogger sites only, such as Typepad and Wordpress. Your address is blogspot so it's a Blogger site and won't have a problem. I think that if we just provide our readers several ways to subscribe (not only google friend connect) we're okay. I'm about to get rid of the entire thing it's so complicated at times. If you have a connection with a bloggy neighbor that you like, you find ways to stay connected. Anywho, have a lovely evening. I haven't heard any of this. I sure hope we don't have to start all over for Pete's sake. This looks lovely. I have a soaking tub but so rarely use it. There never seems to be time! Tell me about it! I need a bubble bath everyday. I make myself crazy when I am sitting or doing something and I am constantly thinking about how I can change what I am looking at. There has got to be a "syndrome" name for that! LOL!.. I have Wordpress and it don't allow me to add the Google Friend Connect. They are replacing it with Google Plus, I believe. i guess we will all know soon enough! Have a wonderful day! 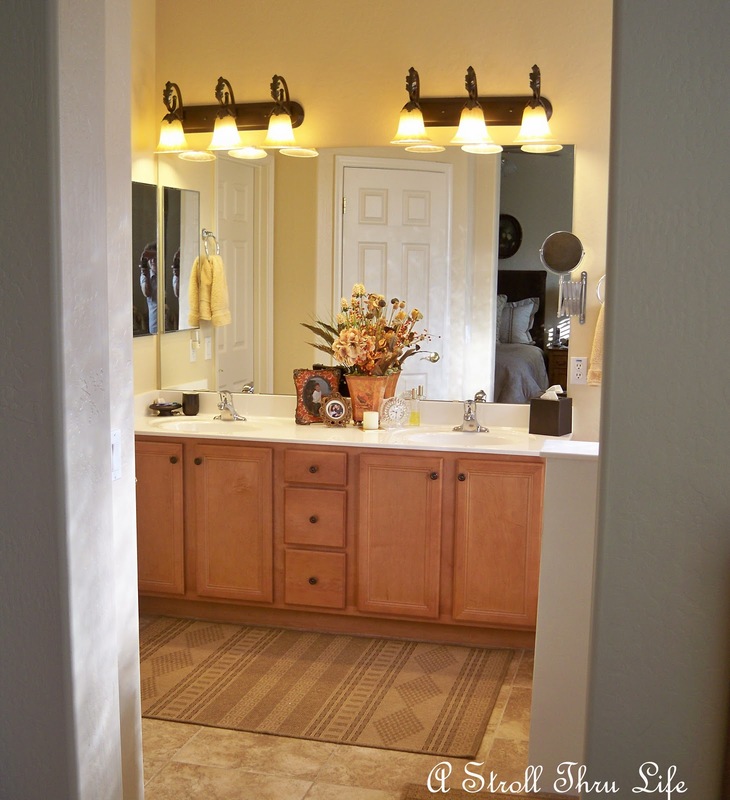 Your bathroom looks lovely. You always have the perfect vignettes. I'm totally confused about the Networked Blogger thing. I am following yours, but no clue as to whether I added that to mine correctly. Guess we'll see if anyone follows there. Aarrrgh...I'm still "fussing" over the new Blogger Dashboard -- much preferred the other one! the way I read it, if you don't use blogger you will lose it...so those on wordpress and other sites will no longer have GFC. Those on Blogger will still have it. A lot of us are now adding Google + so we can follow there. Always changes that confuse, right? Sweet! My kids are always asking if things around the house will go on the blog. Yes, I think it means that Blogger bloggers will still have the option to use it if they want, but not other types of bloggers or other sites. I'll have to check out Networked Blogs too though. I had looked into it for posting to Facebook, but it didn't look like they linked back to my blog, but to their site (like I would be loosing a page view). Not that I am blogging for money or anything, it just looked weird. Wow, I'd not heard of this, thanks for the heads up, will check it out!